Lora Lee Gayer and cast perform "Shoeless Joe from Hannibal, MO" from "Damn Yankees." Angel Reda as Lola in"Damn Yankees." Ron Wisniski (Coach) and Stephen Mark Lukas (Joe Hardy) in "Damn Yankees." Super Fans, Sister, and Doris in "Damn Yankees." Goodspeed Musicals throws a change-up into its current rendition of this storied musical. Based on the book The Year the Yankees Lost The Pennant by Douglass Wallop, the show uses the Faustian legend to tell the story of Joe Boyd, a middle-aged dreamer who’s willing to make a deal with the devil to become a big league slugger. The deal is all for the sake of leading his beloved Washington Senators, a loser of a team, to an American League Pennant. Goodspeed Musicals throws a change-up into its current rendition of this storied musical. It uses the recently-developed book by Joe DiPietro, which centers the action around the '52 Red Sox. How perfect, because we know the score: since 1918, a hapless and hopeless bunch, they can never seem to catch the boys in pinstripes. Joe’s (James Judy) nightly obsession with the Sox, which happens in the glow of his television set, has come at a price. Years of baseball devotion have taken a toll on his marriage to Meg (Ann Arvia), a loyal and loving wife, who doesn’t share his zeal for the national pastime. When Mr. Applegate ( David Beach) appears on the scene -- the devil himself, disguised in a shiny silk suit -- it doesn’t take much convincing for Joe to sign a lucrative, short-term deal. By transforming into the hard-hitting Joe Hardy for two months, he will knock out homers, reverse the curse, and bring down those damned Yankees! All that for a simple swap. The terms of his pact: leave his old life behind, including Meg, and trade in his soul. 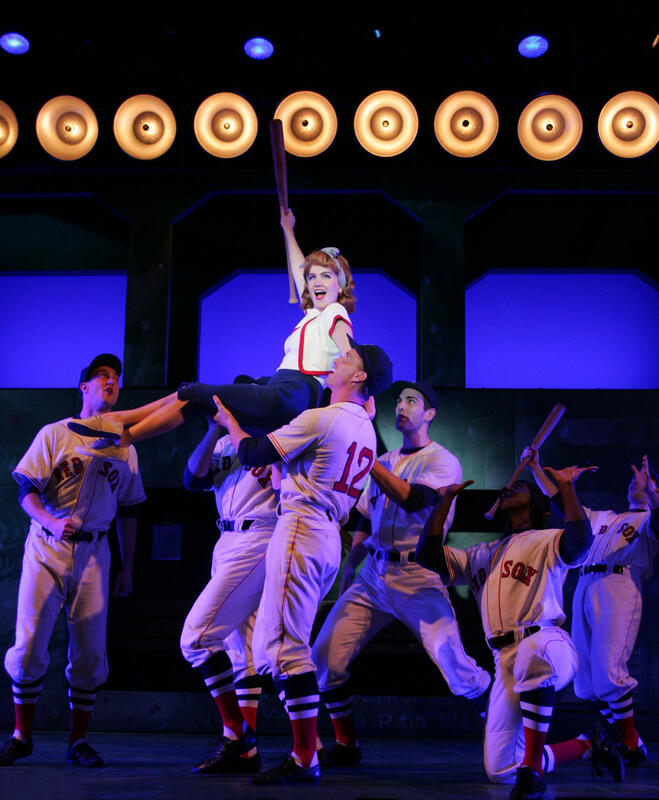 From its out-of-the-park dance numbers, to the well-timed tongue-in-cheek baseball dialogue and choreography, musical theater showmanship is in full gear on Connecticut’s band-box of a musical stage. It includes a tight-knit orchestra that knocks out many enjoyable hits from the Richard Adler and Jerry Ross score. "You've Gotta Have Heart" in "Damn Yankees." The warm, colorful lighting by Brian Tovar brought back memories of the Topps baseball cards I collected as a kid. Right at home in the locker room, those loser boys sweat, slide, and give baseball signs new meaning. The famous number “Heart” is a stand-out, cleverly staged in the Fenway Park showers. It's more than just a few towel slaps of high testosterone fun. It features a gargling chorus, and I leave the rest to your imagination. Things get even steamier when the long-legged Lola, played by Angel Reda, appears as the devil’s right hand. She’s assigned to use her sexual powers to insure that Joe keeps his pact. When he resists her charms out of faithfulness to Meg, whom he’s now missing deeply, Lola admits she’s no major league femme fatale, and that what’s in your heart is all that really matters. With all that said, much like Joe Boyd himself, the production directed by Daniel Goldstein does at times come dangerously close to selling its soul to the musical theater gods. It almost forgets what matters behind all the spectacle and adrenaline, and it takes Ann Arvia as Meg Boyd to remind us. In the number, "A Man Doesn't Know," Boyd beautifully bunts her way into our hearts with tender and truthful moments. Her consistently honest portrayal of a woman who is hurt but patient, a little lost, and ultimately faithful, is what keeps me listening and in the game when some of the other numbers blow by like fastballs. She’s the pine tar that makes the Goodspeed production stick. Together with Stephen Mark Lukas as the young Joe Hardy, their work makes for a natural, double-play combination. Lora Lee Gayer and cast in "Damn Yankees." A clever, adaptable, and multi-leveled setting by Adrian W. Jones, complete with a huge symbolic painting of Fenway Park surrounded by light towers (nice touch! ), sets an effective vintage ballpark mood. David C. Woolard’s solid collection of '50s costumes and big-league uniforms do the job, but I would have stolen third for a chance to watch Lola get what she wants wearing something in flaming red. The warm, colorful lighting by Brian Tovar brought back memories of the Topps baseball cards I collected as a kid. Between now and June 21, and let Goodspeed’s fine cast and first rate creative team take you and the family out to the ballpark in 1950s musical theater style. If you go: "Damn Yankees" plays on Wednesdays at 2:00 and 7:30 pm, Thursdays at 2:00 and 7:30 pm, Fridays at 8:00 pm, Saturdays at 3:00 and 8:00 pm, and Sundays at 2:00 pm. Goodspeed Opera House, 6 Main Street, East Haddam, ​(860) 873-8668, boxoffice@goodspeed.org, or goodspeed.org.